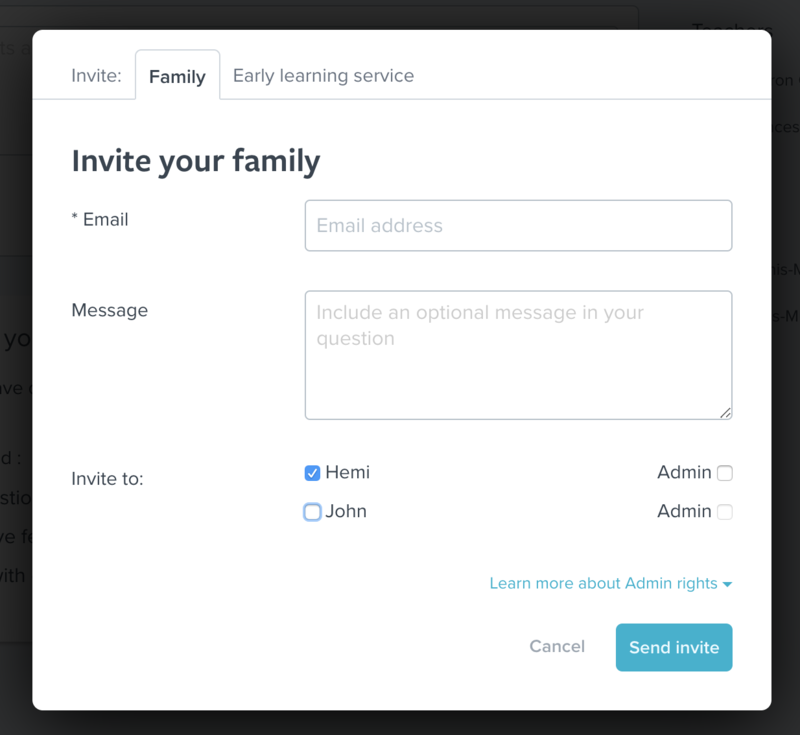 Only family Admins (this includes the parent who signed up or accepted the invite from their child’s early learning service, and any other family members they’ve made an Admin) can invite other family members to a child’s profile. This ensures parents approve of everyone who has access to their child’s profile. Learn more about family Admins here. 2. A drop-down form will appear. 3. Ensure the ‘Family’ tab is selected at the top of the box, and then complete the form, entering your family member’s email address. 4. It's a good idea to add a custom message that will be included when the invitation email is sent. Invites with custom messages add a personal touch and are more likely to be noticed in the recipient's inbox. 5. Choose whether this person should be an Admin or not. 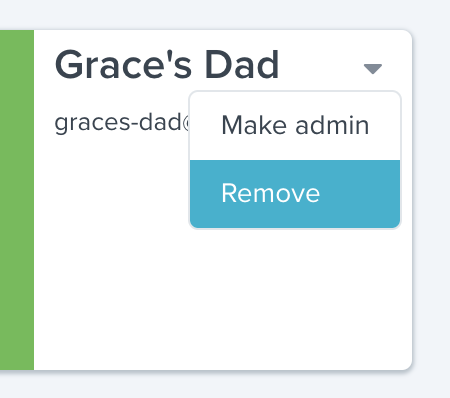 Admins have access to day-to-day management features in Storypark so generally, only the child's other parent or another primary caregiver such as your partner should be given Admin rights. it is not needed for other family members. 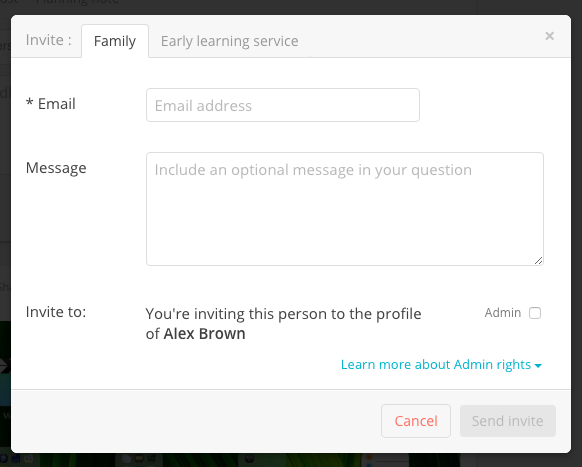 Learn more about Admin rights here. What happens when you click ‘Send invite’? 1. Once the email is sent you’ll see a ‘Pending’ label beneath their name on your ‘Family’ page. 2. 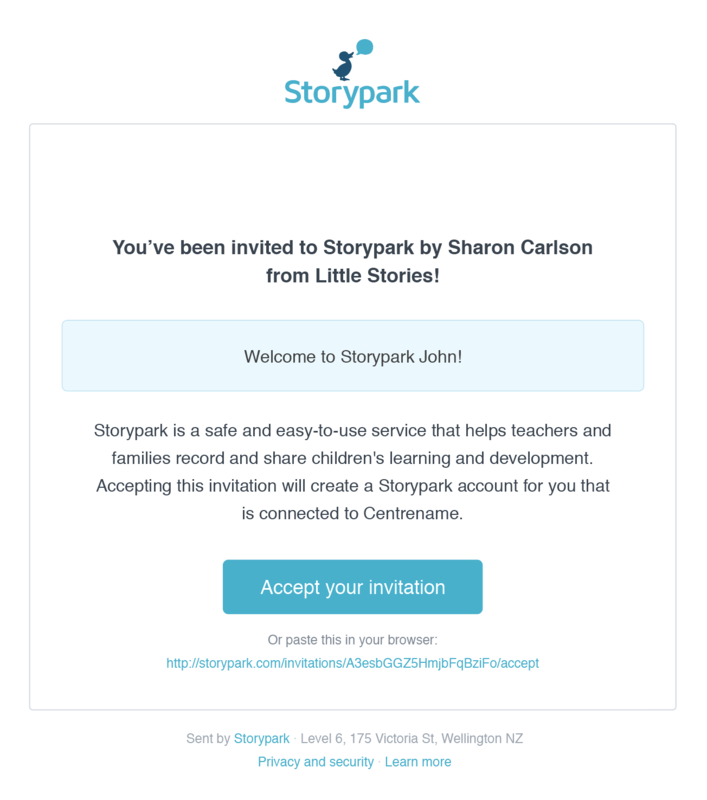 The invited family member will receive an email invitation which includes an introduction to Storypark and some useful links to help centre ‘Getting started’ articles. 3. Once they click ‘Accept’ in the email they’ll be taken to a simple sign up page where they can enter their details to set up their account. 4. When they’ve finished signing up, the pending label next to their name will be gone. 5. You can give any family members who haven’t yet accepted your invite a gentle reminder by finding someone with a ‘Pending’ label, and clicking 'Resend’. Besides family members, you may want to involve other experts to help support your child’s learning. These may include speech language therapists, teacher aides or other experts and specialists. It’s your choice what level of access you give them and for how long. In Storypark, specialists are treated like family members. To invite a specialist simply follow the above steps, as if you were inviting a family member. You may choose to invite a speech language therapist who you know and trust to have ‘Admin’ access over your child's account. This would enable them to see all the stories and comments that are created and also share their own observations with you in your child's private ‘Notes’ area. 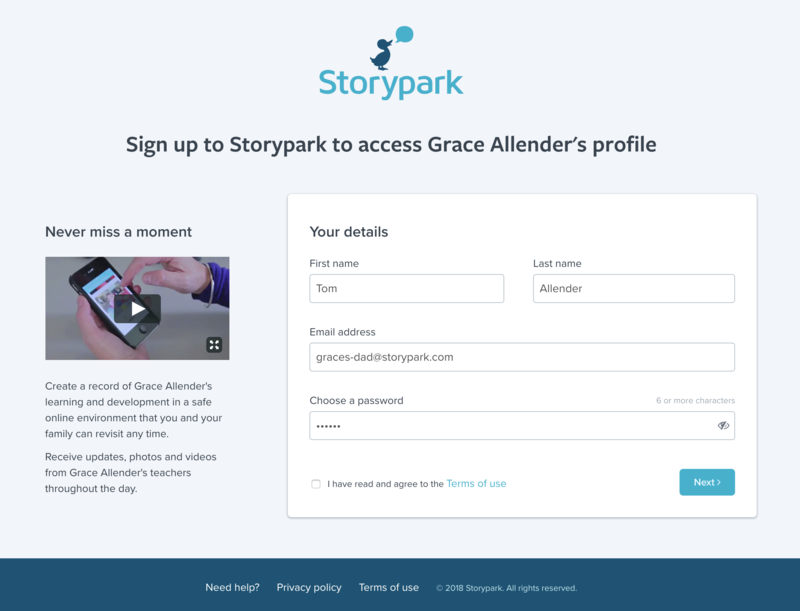 Specialists can be invited to Storypark without admin rights. However, this means they can’t participate in your child's private ‘Notes’ area; only view, create and comment on learning stories. You can remove people from your child's Storypark account whenever you feel it is appropriate to do so. Only family Admins have the ability to remove others. Go to your child's profile page and click the 'Family' tab. Find the family member you wish to remove and in the top right corner of their tile click the small arrow. From the drop-down menu select 'Remove'.